Explore a mysterious underground world of rushing water before drifting in silent darkness beneath the luminous shimmer of thousands of glow worms. 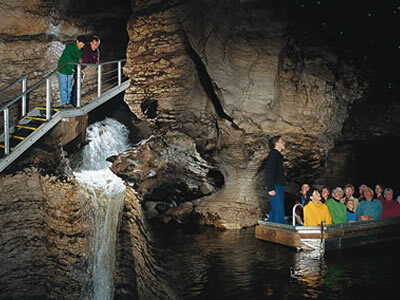 Your Te Anau Glow worm Cave adventure begins with a scenic cruise across Lake Te Anau to the western side of the lake. Upon arrival there is time to view informative displays at Cavern House before our friendly guides invite you to accompany them underground in small groups. 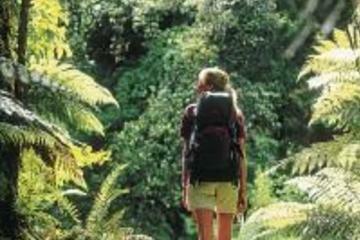 Experience a morning guided walk to Giants Gate on the world famous Milford Track. From Milford Sound the track is access by water taxi and follows the mighty Arthur River through lush, temperate rainforest to Giants Gate, a most photographed and spectacular waterfall. This walk is suitable for all skill levels. We begin with a short boat ride across Milford Sound’s Deep Water Basin to Sandfly Point, adeptly named as you will see! This is the end point of the Milford Track, but the start of our Milford hike. From there we begin our guided walk, meandering alongside the cascading Arthur River then Lake Ada, on a well formed track. Our destination and half way point is Giants Gate waterfall. This spectacular waterfall is best viewed and photographed from the large swing bridge spanning the river. Walking in a small group (maximum 12 people), your nature guide will point out the native fauna and flora, and share the fascinating human heritage of the track, bringing the area to life. 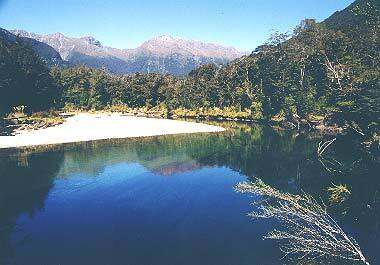 TThe Milford Track is a four day walk, considered to be one of the best walking experiences in the world. If you do not have four days available Real Journeys, in association with Trips ‘n’ Tramps, offers the chance to experience part of this world famous track on a one day guided walk. This summer you can experience the first section of the world famous Milford Track as a one day adventure suitable for walkers of most ages and fitness levels. Following a coach transfer to Te Anau Downs, cruise to the head of beautiful Lake Te Anau and the start of the track. On your walk you will follow the Clinton River for a short way, cross a swing bridge and then on through ancient beech forest to the Clinton Hikers Hut. Lunch is enjoyed beside a mountain stream or at the Hut. 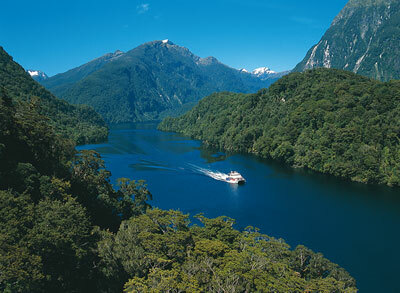 Your Doubtful Sound adventure begins as you cruise the crystal clear waters of Lake Manapouri. Then its over Wilmot Pass, stopping along the way to experience some of Fiordland's densest rainforest and to view the colourful alpine moss gardens. On reaching Deep Cove, you will board our spacious catamaran for a three hour cruise that takes in the most dramatic scenery of doubtful sound. Our skippers provide a detailed commentary and point out highlights. Keep a look out for wildlife as bottlenose dolphins frequently come alongside our vessel, fur seals bask on the rocks around the fiord and rare penguins can at times be observed. Depart Te Anau, the "Gateway to Fiordland" and enter the Fiordland National Park, to be mesmerized by the grandeur of this region. As you pass through the Eglington Valley, you will see ancient alpine beech forest, stunning waterfalls, and the famous Mirror Lakes where the coach pauses for photo opportunities. EEnjoy a relaxed, small group day excursion to Milford Sound, including a nature boat cruise along the full length of the fiord to the Tasman Sea. Then select either a series of short walks and exploration with a local nature guide, or 2 1/2 hours hiking (unguided) on the renowned Routeburn Great Walk to Key Summit. On reaching Milford Sound you will join a morning Nature Boat Cruise 2.5 hours in duration. The cruise provides excellent viewing opportunities, and plenty of time available to enjoy the waterfalls, rainforest, mountains and wildlife (seals, penguins and dolphins) around the fiord. A walk in Fiordland is a must, even if it is only a few hundred meters. On completion of the cruise we begin our overland tour. Depending on your motivations you can choose a series of short walks with the nature guide or 2.5 hours walking on the Routeburn Track to Key Summit. An overnight cruise amidst spectacular Milford Sound, is a once in a lifetime experience. While on board the Milford Mariner you will cruise the full length of this spectacular fiord to the Tasman Sea before anchoring for the night in sheltered Harrison Cove. The vessel explores many points of interest, with plenty of time available to view waterfalls, rain forest, mountains and wildlife with the experienced nature guide on board. The Milford Mariner offers you a very special dinner, bed and breakfast experience. With a nature guide at hand you can explore in the tender craft and kayaks or simply relax on deck. After the days activities, enjoy a delicious evening buffet in the spacious saloon before retiring to your private cabin. The Milford Mariner caters for visitors who enjoy comfort combined with activity. 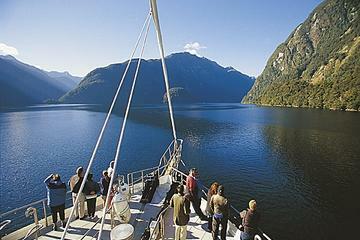 It has a spacious dinning saloon, observation lounge and large open deck areas for viewing the scenery of Milford Sound. EExperience the natural beauty of Doubtful Sound on an overnight cruise departing from Manapouri on New Zealand’s South Island. Cruise on a traditional three-mast sailing scow (flat-bottomed trading boat) along the pristine waters of the fiords, and see a vast array of wildlife including dolphins, seals and penguins in their natural habitats. 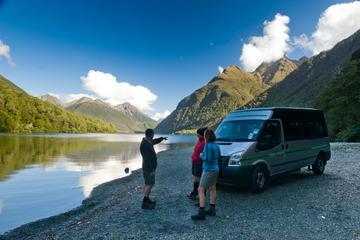 Your Doubtful Sound overnight adventure begins with a short cruise across island-studded Lake Manapouri and a coach trip over Wilmot Pass. You'll then descend to Doubtful Sound to meet the crew and board the sailing scow awaiting you in Deep Cove. The sailing scow is purposely built for these waters and designed along the lines of a traditional sailing vessel, combining the charm of a bygone era with all the modern comforts, including spacious viewing decks, a dining saloon, fully licensed bar and an observation lounge. Cruise the full length of the fiord, weaving through hidden coves and waterways. Doubtful Sound is home to a vast array of natural flora and fauna. See bottlenose dolphins, fur seals and penguins in their natural habitats from the vessel’s large viewing decks and platforms. A specialist nature guide is on board to provide commentary and insight into the history of the region.